Shenandoah National Park was opened in 1935 but the plans for the road that feeds the park dates back to 1924 when a national park was planned in the Blue Ridge Mountains of Virginia and the main feature was to be a “sky-line drive” providing views of the surrounding land. Cars were becoming a thing, and driving was making the U.S. smaller and more accessible. President Herbert Hoover called for the construction of the road. The Civilian Conservation Corps played a large part in constructing Skyline Drive. Improvements have been made to the roadway since it was built. The drive’s northern end is at an intersection with U.S. Route 340 (US 340) near Front Royal, and the southern end is at an interchange with US 250 near Interstate 64 (I-64) in Rockfish Gap, where the road continues south as the Blue Ridge Parkway. Skyline Drive was added to the National Register of Historic Places in 1997, became a National Scenic Byway in 2005, and was designated a National Historic Landmark in 2008. We began our experience at Front Royal, just over an hour drive from Washington Dulles International airport in Washington D.C. After a good night’s rest at the Holiday Inn and a hearty breakfast at L’Dees Pancake House we headed to the park entrance. $30 per vehicle for entry on seven consecutive days. Our first stop in the park was the Dickey Ridge Visitor Center (Mile 4.6). We had done a lot of research and prep work on the best trails for our capabilities but it is always important to talk to a ranger and get their perspective. We also got our daughter the Junior Ranger program book. Another must-do with kids. Skyline Drive offers stunning vistas of the mountains and the valleys of Virginia with 75 overlooks within the 105 mile drive. Each is clearly marked on the road with enough parking space and safety measures to pull out and in to the road. Part of the experience of Shenandoah is doing the drive, stopping at these overlooks and taking in the views. Wildflowers dot the shoulders and often wildlife can be found to be making their own crossing. White Tailed deer is abound in the park. The speed limit is 35 mph, so don’t speed, slow down, this is life meant to be driven through in a relaxed pace. There are mile posts along the way so knowing where each trail head comes is also important. This trail starts across from the Dickey Ridge Visitor Center and is relatively easy for kids and grandparents. There is a 310 ft elevation change so always check for that in the trail maps. The trail is a loop and winds its way through woods, past old settlements and the Fox cemetery, reminding us that a lot of this was private lands a hundred years ago. It took us 75 minutes to complete. From the Lands Run parking area, follow the fire road downhill for about 0.6 miles and then follow the stream till you reach the falls. The falls is a series of cascades that tumbles 80 feet into the gorge. This is a great place for exploration as you can follow the stream or find your way, carefully, down to find complete views of the waterfalls. The rocks are wet and slippery so make sure you ground your feet before each step. This trail also has a 325 ft elevation gain. Trails in Shenandoah are at a higher bar, especially if you are a novice like me. If you are travelling with kids and older people then pay even more attention to all the distances, the elevation and the suggested time to complete. Double it in most cases. Even the trails marked easy have big elevation gains, have narrow paths and none of it is paved. Shenandoah is hikers’ paradise, but definitely challenging for the occasional hiker so choose your trails carefully. The rangers are a great help. With two completed trails and plenty of overlooks we reached our lodging for the night, at the historic Skyland Resort, located at the top of the fabulous Skyline Drive (Mile 41.7). Skyland was established in 1888 as the perfect spot for a vacation retreat. At 3,680 feet, it provides breathtaking views of the picturesque Shenandoah Valley, as well as many hiking trails, and various other guest activities like horseback riding, and rock climbing. There are over 150 rooms, along with cabins. There is a restaurant, a bar (Tap Room) and a gift shop. The restaurant gets crowded so go early, put your name down, explore the area and come back in time for dinner. The patio by the restaurant is a good place to see the sun set and paired with a cocktail from the Tap Room, and the aches and pains from the hiking should melt away. We had another 60 miles to do on the drive so we planned to make it all the way down and then slowly make our way back up. Our first stop was the Byrd Visitor Center (Mile 51). This is the only other visitor center in the park and it is in the Big Meadows area. This was a ranger led program. It is an easy walk, through tall grasses and the big meadow and with no elevation. Big Meadows is a unique feature in the middle of the mountain tops. This is a stopover for the Monarch butterflies. The meadow was covered in a blanket of bright wildflowers and the ranger taught us about the reason for the formation of a meadow, early settlers, controlled fire burns and pastures for wildlife. Every year parts of the meadow is burnt to allow for new life to form and the cycle of nature to continue. Keep your eyes peeled to the intersection of the forest and the meadow as black bears, common in Shenandoah, might come down to find the berries that grow in the meadows. It started to rain, and this made it perfect for us to sit inside our car, drive the winding road, listening to the rhythmic rain drops and jumping out occasionally to enjoy the views. We drove even more slowly and made it all the way down the south entrance to the park. From the Blackrock parking area, follow the Appalachian Trail (A.T.) south. At the trail post, continue to the boulder field where you can see the layers and the quartzite patterns on the rocks and the beautiful view. It is a loop with a 175 ft elevation but the path is rocky. The Appalachian National Scenic Trail, generally known as the Appalachian Trail or simply the A.T., is a marked hiking trail in the Eastern United States extending between Springer Mountain in Georgia and Mount Katahdin in Maine. The trail is about 2,200 miles (3,500 km) long, and is often described as the longest hiking-only trail in the world. Most of the trail is in forest or wild lands, although some portions traverse towns, roads and farms. It passes through 14 states: Georgia, North Carolina, Tennessee, Virginia, West Virginia, Maryland, Pennsylvania, New Jersey, New York, Connecticut, Massachusetts, Vermont, New Hampshire, and Maine. The Appalachian Trail, the Continental Divide Trail, and the Pacific Crest Trail form what is known as the Triple Crown of Hiking in the United States. Lunch was at the Loft Mountain Wayside (Mile 79.5) where pizza, salads and fries are available. Unlike other national parks, because Shenandoah is in a more urbanized location, and Skyline Drive is a good connector, there are a few places with cafeterias and food is not a problem. On the hikes, do remember to pack energy bars, nuts, fruits and lots of water. This is not an easy trail. It is shorter but one of the most difficult trails and definitely not recommended if you are not looking for a workout. There is 305 ft of elevation and the entire trail is a narrow, rocky, path up the mountain. At the trail post, turn right onto the Appalachian Trail (A.T.) south. Go left on the connector trail, then turn right on Bearfence Loop Trail. You’ll see the viewpoint on your right. Retrace your steps to the starting point. If you are more adventurous or forced to be because of your 7 year old then you can return via the Bearfence Rock Scramble route, which means you’ll be pulling yourself up, over, and between boulders, using your feet and hands. The end is worth it as you will find yourself on top of the mountain with a 360 degree view. But the journey is not for the faint at heart. It was a teachable moment for my daughter as she was convinced she could do it and would not take no for an answer but then found herself struggling and at parts even paralyzed with fear of the height and the sheer drops. To her credit she hung in there and followed my instructions and we worked our way through it. It was a bonding moment but one that we should have saved till she was a little older. We made our way back to the Skyland Resort area and stopped at the Timber Hollow Overlook to watch the sunset. As I was setting up my tripod other photographers joined in and we had a mini national park lovers community. The sky at sunset is nature’s canvas and every evening, no matter where you are the painting rarely disappoints. My wife, many years ago, commented how the sun doesn’t set but it plummets, so yes, once it starts setting it disappears fast so stay in the moment. After dinner, and after most of the campground had gone to sleep, and the lights were all off, I stepped out to see the night sky. Shenandoah is not a dark-sky area but it was certainly darker than the light polluted city of Chicago. After letting my eyes adjust for a while, slowly, the thousands of stars began to twinkle and the Milky Way galaxy started to appear. Oh, what a sight! It took even longer for me to get my camera settings right, but Oh, what a sight! We started the day with a return to the Byrd Visitor Center to enable our daughter to become a Junior Ranger at Shenandoah National Park. She was sworn in, and now with her new responsibilities, she led us on our last hike. The easiest trail we did. This was not paved, but very close, with stones leveled that would allow for wheelchairs and strollers. There was very little elevation gain and this made it more of a leisurely stroll rather than a hike. Just what we needed to end our trip to Shenandoah. The path leads past rocky growths, more rock climbing adventures, and leads to a wider area where deer roam. 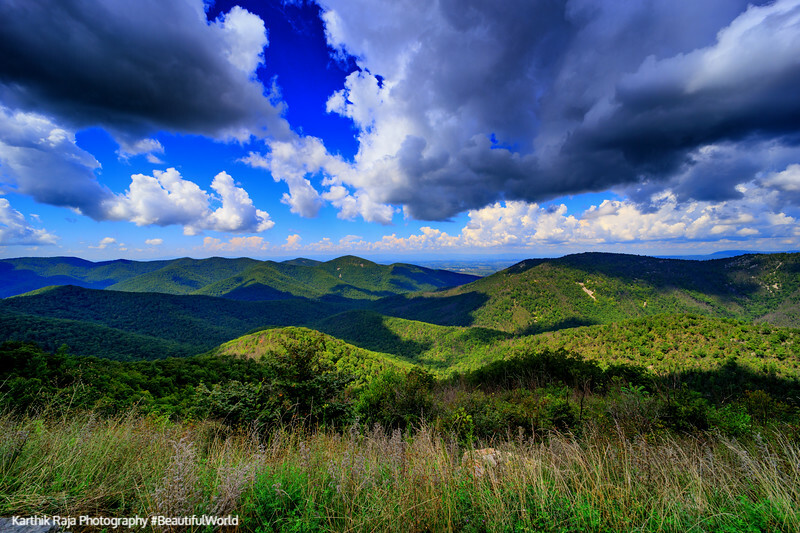 Shenandoah has over 500 miles of trails, many intersecting or part of the Appalachian Trail. We did less than 10 miles of it, but it has awakened the hiking gene in us. We were always nature enthusiasts and National Park lovers but now we are committed to making the most of the outdoors and even more committed to protecting it. Thank you Shenandoah National Park. 10 miles west of Shenandoah National Park, closest to the Thornton Gap Entrance (Mile 32) is Luray Caverns. The caverns are situated in the Shenandoah Valley, just to the west of the Blue Ridge of the Appalachian Mountains in Luray, Virginia. The caverns was discovered on August 13, 1878 by five local men, who had been attracted by a protruding limestone outcrop and by a nearby sinkhole noted to have cool air issuing from it. After digging for about four hours, a hole was created and the caverns history began. Visitors enter after the usual photo ops and into a large hall. The entire trek is 1.5 mi (2.4 km) long and can be completed in 45 minutes to 1 hour and is only done with a guide. Enormous chambers are filled with towering stone columns, shimmering draperies and crystal-clear pools. The National Park Service and the Department of Interior designated it a Registered Natural Landmark. Luray Caverns is the largest and most popular caverns in Eastern America. The path winds its way to Dream Lake, an optical illusion that will amaze and confuse. Its deepest point is not more than 18 to 20 inches but this sparkling lake reflects a myriad of fantastic forms and creates a mirror image of the abundant stalactites hanging from the ceiling making it seem like there are stalagmites growing from the base but in reality nothing is. All formations in the caverns are calcite, a crystalline form of limestone. Calcite in its purest form is naturally white. Titania’s Veil is a pristine example of a calcite formation in its finest purity. Dominating Giant’s Hall at a height of 47 feet, a double column is a classic example of the two basic cave formations the stalactite and stalagmite coming together as one massive wonder of nature. The formations are 700 million years old, young by the age of the earth. Another interesting feature is the Great Stalacpipe Organ, the world’s largest musical instrument. When creative ideas merge with physics, it ends with us standing many feet underground and listening to little hammers hit the formations and mimic the sounds that you will hear in large church organs. The temperature inside the caverns is uniformly 54 °F (12 °C), comparable to that of Mammoth Cave National Park in Kentucky. Also part of the complex is the toy museum and the Car and Carriage Caravan museum and both are included as part of the entrance fees to the caves. Worth the visit if you have the time and you want to spend more time above ground after all the time below it. We made our way back to Washington D.C. our home for the rest of the week. Previous Pikes Peak Region and the Garden of the Gods. A must do day trip from Denver.